Exchange 2010 includes Administrator Audit Logging functionality to log all administrator actions. Because all administrator actions, including those taken using the EMC and the new web-based ECP consoles must fire off a Shell command under the hood, admin audit logging records cmdlets that can make changes (the ones that use the New and Set verbs, for example — New-Mailbox, New-DistributionGroup, Set-ReceiveConnector, etc.). However, changes to Exchange configuration and recipient objects, which reside in Active Directory, can also be made directly in Active Directory if an administrator has adequate permissions. 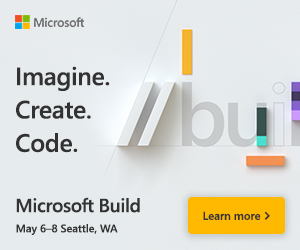 Whereas it’s not a good idea to make such changes to most Exchange Server configuration settings and recipients directly by modifying Active Directory objects, tasks such as modifying group memberships are possible using tools like Active Directory Users & Computers, ADSIEdit, or programmatically using the Active Directory Services Interfaces (ADSI) provider. Such modifications bypass Exchange 2010’s Role-Based Access Control mechanism, and thereby the admin audit logging functionality. 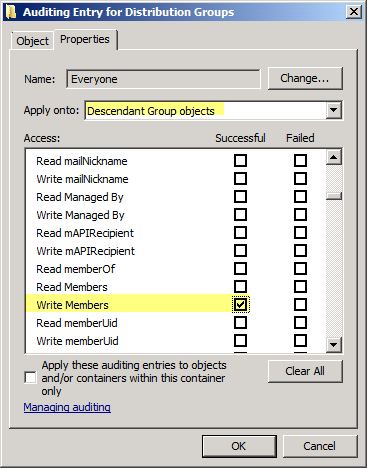 To audit changes to Active Directory objects, you must enable auditing in Active Directory. Let’s take a look at how this can be done in Windows Server 2008 and later. 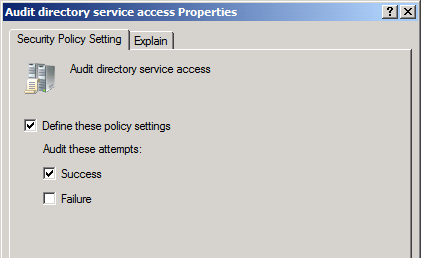 In Windows Server 2008 and later, you can enable auditing of Directory Service Changes, a sub-category of directory service access. This records object creation, modification, moves and undeletes. The event log entries include information about the old and new values of the parameter modified. In case of multi-valued attributes such as the member attribute, one event log entry is recorded for each value (each group member) that’s added or removed, even if you add/remove multiple values in a single operation. 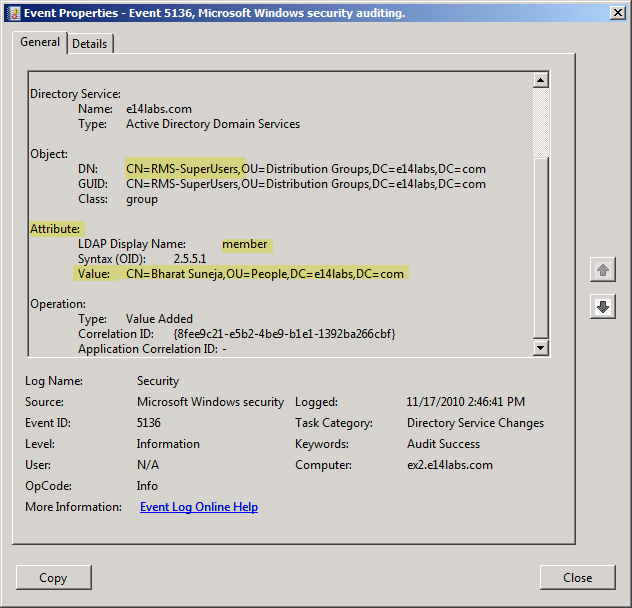 You can enable auditing of Directory Service Changes using the auditpol.exe command. In this example, all our distribution groups are located in the Distribution Groups OU. We’ll configure the OU to apply auditing settings to all its descendant (child) group objects. Further, the specific event we want to audit is use of Write Member permission to modify the Member attribute of groups. You can also enable auditing of additional or all events, but auditing events that have little security or compliance value to your organization generates significant auditing noise, which makes locating the important events harder. Additionally, it’s resource-intensive — the higher volume of logs it may generate will need to be stored or archived for some time, depending your organization’s requirements. Needless to say, searching larger data sets is slower. Make sure auditing requirements are clearly outlined and understood before enabling auditing. Start Active Directory Users & Computers console and navigate to the OU or container for which you want to configure auditing (Distribution Groups OU in this case). Figure 2: You can configure auditing granularly at the object (security/distribuiton groups) level, at the OU or container level, or for the entire domain. In this example, auditing of successful use of Write Members permission is enabled. After you enable auditing of group membership changes, any changes to the member attribute are logged in the Security event log. Event ID 4662 is a notification event which notes that changes have been made, but isn’t very useful otherwise. Event ID 5136 (see screenshot below) shows you name of object, object attribute modified (member), Operation performed (value added), and the value which was added (distinguishedName of user added to the member attribute). Figure 3: Event ID 5136 logged in the Security event log provides detailed audit information about group membership changes, such as object modified, attribute modified, type of operation, and value added/removed. Shell jockeys can use the Shell to search the event logs. In PowerShell v2, the Get-EventLog cmdlet provides more filtering capability for searching event logs, including the much needed capability to search by the Event ID (thanks PS folks!). This command searches the Security event log for Event ID 5136 that occurred after Nov. 15th. The InstanceID parameter is used to specify the Event ID. I personally use Lepide AD auditor to monitor the changes made in active directory. It has centralized system auditing feature that helps to audit all domains in the network at a centralized location and sends real-time alerts of all critical changes instantly by customized email notification. Thus, we can see a clear picture of the AD object status for every second. Nice post, thanks for sharing this article, I tried this LepideAuditor Suite( http://www.lepide.com/lepideauditor/) for this. This software helps me to audit Group Policies and get the complete detail who is doing what, when, and from where. Previous post: Exchange ActiveSync: What is the Allow/Block/Quarantine List? Next post: Exchange Server 2010 Inside Out, and do technical books still matter?